"Dear Arensberg's, my name is Scott Schaefers, son of Jerry..."
"Jeff and all of the families, I am sorry to hear of your..."
"Mary, so sorry to hear about Jack. His name brought so..."
"Jack was a good ol boy. He will be missed"
" Tom I am sorry for your loss of your beloved Dad. You have..."
John Louis (Jack) Arensberg died Monday, September 3rd at Lawrence Memorial Hospital at the age of 91. Jack was born on July 4, 1927 in Atchison, KS to Lee and Agnes (Curran) Arensberg. After graduating from Atchison High School Jack enlisted in the Navy and served in WW II. After the war Jack attended Benedictine College in Atchison Kansas. He graduated in 1950 with a degree in Business. Jack married Mary Clark on July 19, 1958. He moved to Lawrence, KS in August of 1958. 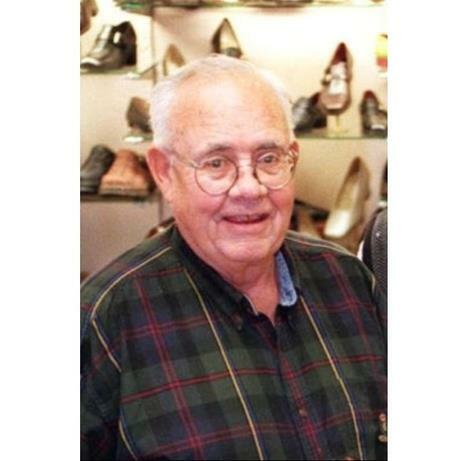 Jack owned and operated Arensberg's Shoes in downtown Lawrence for 50 years. During this time, he served as president of the Downtown Lawrence Association, president of the Breakfast Optimist Club and was a member of the Elks Club. He was a member of St. John the Evangelist Catholic Church where he served as an usher for many years. Jack's hobbies included fly fishing in Colorado, quail and pheasant hunting in Kansas and playing golf at Lawrence Country Club, where he was a member for 58 years. In his retirement, Jack enjoyed his morning coffee with friends at McDonalds. Many thanks to Herbie Weidensaul and Marty Pattin for providing his transportation. Jack is survived by his wife Mary of the home and his children: Tim (Deanne), Tom (Anita), Jeff, Andy (Denise) all of Lawrence; Julie Pfister (EJ) Edmond, OK, his 7 grandchildren and sister Gay Lacy, Scottsdale, AZ. He was preceded in death by his brother, Lee Arensberg..
A Mass of Christian Burial will be held at 11:00am at St. John the Evangelist Catholic Church on Thursday, September 6th with a family burial to follow. A reception will be held at Lawrence Country Club at 1:00pm. In lieu of flowers, please send donations to Lawrence Memorial Hospital Endowment Fund and may be sent in care of Warren-McElwain Mortuary.